Looking just like the jars found in old-time candy stores, these miniature jar favors can hold mints or other goodies. Your guests will appreciate your thoughtfulness as these mini-jars can also be used to store nuts, tea bags or even loose change � perfect for home or office. The glass container with a screw-on metal lid may be re-used over and over. 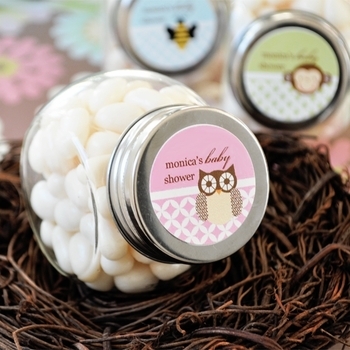 Select from a variety of animal images and personalize the jar with your name and date or message. See More Images above for other pictures and label design options. NOTE: Display items shown in photos are for demonstration purposes only and are not included.